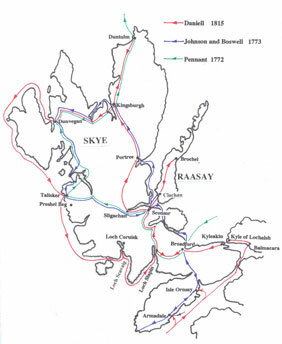 Daniell spent July and August 1815 travelling around the Hebrides, during which he spent two or three weeks on Skye and Raasay. His route is shown on the map. On his return home at the end of 1815, he worked 139 of his sketches up into aquatint prints. Seventeen of these were of Eigg, Rum, Skye and Raasay and were published with an accompanying text in 1818 and 1819. He admits that he found the selection very difficult. There were many very attractive views of Skye and Raasay, which he felt he had to reject in order to maintain a balanced treatment of the complete journey around the British coast.